The Office FootFidget® is a dynamic footrest that is portable for use at the office or at home. 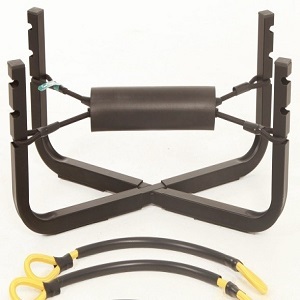 Two sets of resistance bands are included: one medium resistance to use when seated and one heavy resistance band to be used when standing at a standing desk. By fidgeting or pressing against the flexible resistance of the Office FootFidget® with their feet, workers will realize proprioceptive input and energy releasing, focus attaining movement along with increased calorie expenditure of up to 30%. The lightweight, portable design allows for movement of the unit where needed and provides comfortable, ergonomically correct positioning. The Office FootFidget® is NEAT certified by Mayo Clinic.